I was recently at a local bass pro shops just to browse, the new hand gun selections and be shocked at the prices, , while there, a guy comes up too the counter and says too the sales guy, that he wants to purchase a powerful handgun, to hunt hogs with. because on his first hog hunt he used a 45acp commander and was less than impressed, as it took him 4 shots to kill a 220 lb hog. 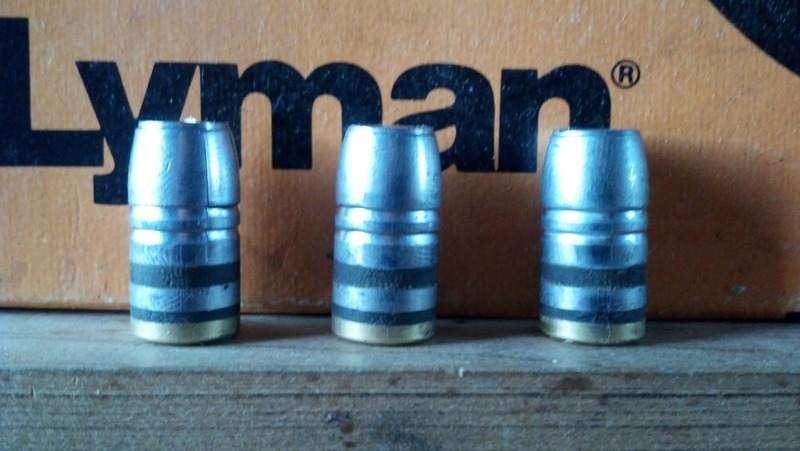 Ive loaded a hard cast 300-310 grain lyman or LEE gas check bullet over 20-21 grains of H110 powder in my 44 mag for decades , (start with 19 grains and work up a 1/2 grain at a time ) it shoots clear thru most hogs and deer exiting and still going strong so be aware you don,t want to shoot a deer with a second deer directly behind the first. YES I PREFER A GOOD CAST BULLET! when selecting a hunting handgun and caliber youll want to consider options that will allow you to effectively drop game from the longest distance , and at the least favorable angles your likely to encounter , and get full penetration at those ranges and angles, this requires some thought on the part of the hunter into what firearm he can reasonably use to consistently get reasonably small and consistent group sizes and research into what bullet will get the job done consistently. 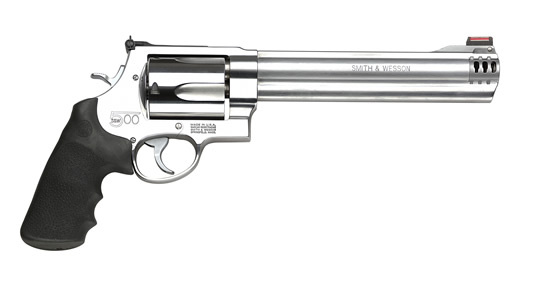 I have several hunting friends that have purchased the S&W 460 AND 500 MAG REVOLVERS, there are very nice revolvers but they are large, heavy and expensive to shoot and once the new-ness ,novelty of ownership, had worn off, I grin when I see them revert to the 44 and 41 mag revolvers they had used for decades , which get the job done effectively at lower cost and effort. Each of us has our own tolerance level, I have zero problem with the 44 mag throwing a 240 grain at 1400fps or 445 dan wesson super mag, throwing a 300 rain at 1500fps, in consistently hitting a 6â€³ paper plate from a sitting position, at 100 yards at the range,but I can,t see any use for the 500 S&W as its just beyond my personal limits on what can be fired fast and accurately out at 50-120 yards, where most hand gun revolver hunting seems to be in my experience. 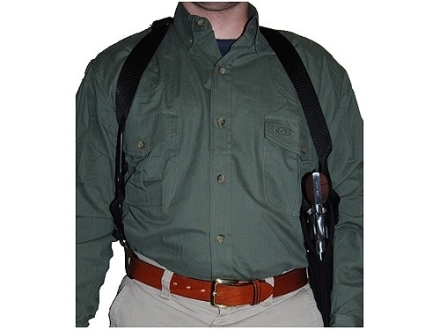 people new to hunting always seem to ask about barrel length, and if a 44 mag has the power required to be effective, you want to keep in mind a hunting revolver is now designed for concealed carry use and a shoulder holster makes it far easier to carry than any hip holster, Ive used a handgun a great deal for hunting white tail deer and hogs and Id strongly suggest a 7.5" or longer barrel for best 100 yard accuracy, Im not saying a 4"- 5.5" barrel can,t be accurate,in the hands of a skilled experienced shot, but in my experience its far from ideal, the longer barrel site radias DOES help, and longer barrels tend to give higher velocity. I found a 6.5" was the minimum I could use and hit consistently, at longer ranges, maybe my old eyes but, its a good deal easier to hit with the 8.375"-10" revolvers in my experience. a properly loaded 44 mag with a 280-310 grain hard cast bullet with a wide melplat (front nose) will easily kill any game in north America with properly placed shots , youll need to experiment, to find what loads and bullets work best for you, but something in that 280-310 grain weight range over a charge of 20-21 grains of H110 has worked great for decades for me! A little over 20 years ago the American Rifleman staff did a test using a 44 Magnum revolver equipped with a 18" barrel that was shortened in one inch increments. Five shots were fired at each barrel length, with each of the three brands of factory loads, Federal, Winchester and Remington, all using 240 gn bullets. The instrumental velocities shown are the averages obtained, after smoothing the data to remove the effects of random variations in velocity and thus to represent the incremental velocity changes more accurately. 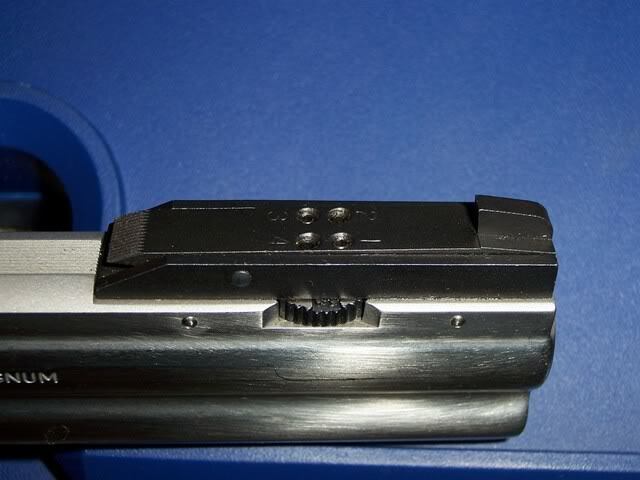 that has been my almost exclusively used load, in my S&W 29, for the last 15 plus years and it flat works, use a firm crimp, seat out to near max length that the cylinder allows and PRACTICE!! the 44 mag is certainly capable if the shooter has the skills to place the shot well. Id try 20 grains of H110 and this bullet cast from 95% wheel weights and 5% tin or Linotype alloy its worked well, but practice until you can place all shots in a 6" paper plate at 100 yards and I would not exceed that range by much in the field, I loaded the guys ammo so I know what was used, both guys were a bit worried at the cartridge performance on ELK before but not after seeing the results. almost everything you do is a compromise in some way, handgun hunting requires you to balance the power that you can handle consistently while maintaining reasonable accuracy that you can obtain under field conditions, over a reasonable range for the game your hunting, in most cases that's limited to a bit more than most people would consider effective archery ranges or well under about 70 yards for most hunters using a powerful revolver or auto pistol on deer or other big game with iron sights. mostly that's the result of the average guys ability to accurately place his shots under those field conditions and the targets tendency to move, and not present a decent target angle. 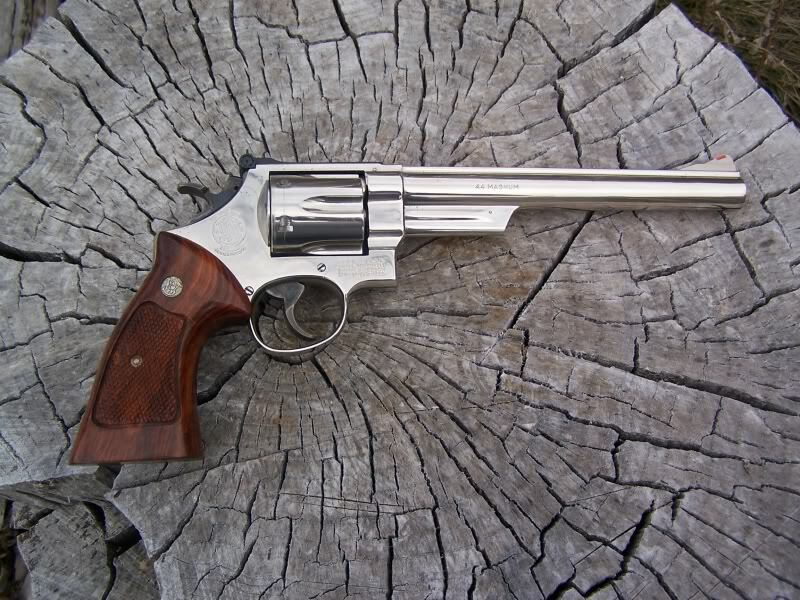 now after hunting with a handgun for many years Id suggest that a 6"-10" barrel length in your average hunting revolver is a distinct advantage as to sight radias, and that recoil levels and required power and bullet weight place the lower power limits near the 357mag and 10mm auto calibers, and the 44mag,480 ruger and 445 dan wesson super mag and 454 cassul as reasonable upper limits for guys just getting started in the sport, the 460 and 500 S&W both exhibit a bit more recoil and pistol weight than most beginners can effectively master , and starting out with one is likely to quickly sour beginners on the experience of hunting with a handgun, not that those calibers don,t do a good job in skilled hands , but you won,t get nearly the required practice due to ammo cost and recoil levels as a beginner with one. 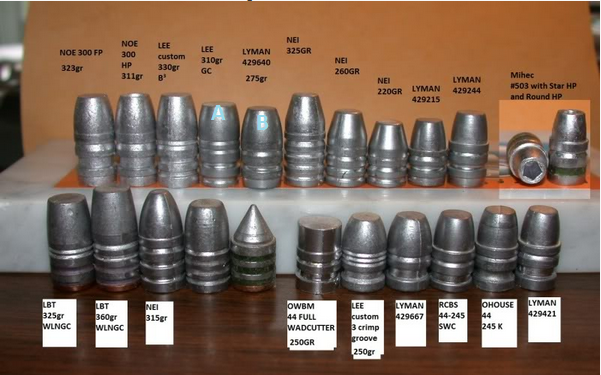 hard cast bullets are "NOT SOLIDS" but they are very slow expending and as such the, high weight retention and limited frontal area tends to allow much deeper penetration,its rare for me to find fired slugs as most exit,but judging from a few I do see, my 44 slugs rarely expand to more than 50 cal. or lose weight while a common hollow point can loose 40%-70% of its weight and expand to over 80 cal. either of these bullets sized .430 and lubed correctly works very effectively on deer & hogs if loaded over 20 gains of h110 and cast from 95% wheel weights and 5% pure tin and cast hot enough to look partly frosted, then dropped in a 5 gallon bucket of water. if your not familiar with hand guns look thru the results of shooting a very high powered revolver when your holding the gun totally wrong! or as my DAD always said"
"IF YOUR GOING TO BE STUPID... YOU BETTER BE TOUGH!, BECAUSE LIFE'S HARD ENOUGH WITHOUT MAKING THINGS HARDER ON YOURSELF, BY BEING STUPID!, IF YOU DON,T KNOW HOW TO OPERATE SOMETHING ASK QUESTIONS...BEFORE YOU LOOSE PARTS OF YOUR ANATOMY, OR KILL SOMEONE!" I was down at the local bass pro gun counter and I was kind of window shopping , looking at the larger revolvers,when this guy shows up and says he wants a heavy caliber revolver for deer and hog hunts, so I start listening to the conversation a bit,the clerk reaches for a 8" 500 S&W revolver, the guys obviously never even held a decent magnum revolver , from the way he holds that one,but its also obvious that, thats far too large/heavy, and even he points that out, the clerk drops back to a taurus 454 cassul mag in a raging bull revolver which the guy seems to like, but he then asked about ammo cost and how bad the revolver will recoil. The clerk asked him if hes ever fired a 44 mag revolver and the guy says, he has ONCE and it was not all that bad but it was about all he could handle, the lying S.O.B. clerk, tells him the 454 cassul is just a bit more recoil than a 44 mag, and ammo's just not much more. 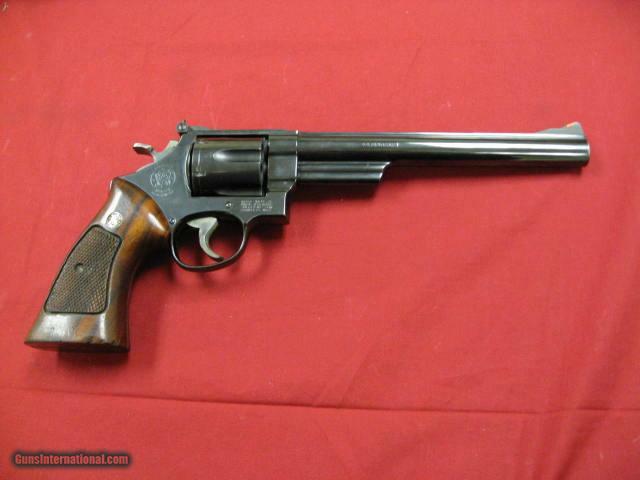 the guy then looks at the S&W 7.5" 41 mag revolver and picks it up and tells the clerk this feels great !,... do they come in 44 mag?, the clerk, tells him that the 41 and 44 mag are too under powered to be a serious hunting choice!hes better off with a 454 cassul, at that point I can,t help myself, I step up to the counter , look the clerk directly in the eyes and ask him how many larger deer and hogs HES killed?????? ?, and point out that IVE used a 44 mag revolver for many years very successfully on both, animals ,with easily a dozen or more of each killed and the bullets tend to zip thru both sides and kill very effectively, so whats to be gained with the larger calibers?? ?,I get a return look from the clerk that says I should LEAVE NOW! I turn to the guy and tell him , don,t be miss informed a 41 or 44 mag loaded with the correct ammo is a truely effective choice, and while its true the 454 cassuls more powerful theres not much gained with that extra energy if its all expended on the ground past the game after the bullet exits...then walk away, Im reasonably sure the clerks pissed but I don,t care. 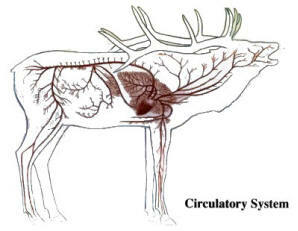 Ive helped recover a few deer that were shot with pistol caliber cartridges and a high percentage were NOT hit as well as the hunter indicated, unlike archery where a sharp broad-head blade tends to promote rapid bleeding a fairly low velocity bullet impact tends to punch thru and not leave a huge blood trail, that doesn,t mean the wounds less fatal,but it does mean you need to take a good deal of care placing shots and practice a great deal before hunting and realistically judge your effective range limitations and although you generally have a effective range advantage with a large caliber revolver over archery equipment, your generally going to find most iron sight revolvers are at BEST a 120 yard weapon and most people should limit shots to range's that can rapidly and consistently place several shots in a 3"-4" circle, and realistically thats under 60 yards for most people Ive seen shoot. I especially remember one guy I know who swore he shot a big buck right in the heart with a 357 mag,from about 45 yards,he spend hours while searching telling anyone who was near him he was going to get a 45lc because a 357 mag was just to small for deer, that buck had just ran off as if it was un -touched, he emptied his revolver at the deer as it bounced out of sight ,he came and got us to help track down that deer, we did a grid search over the area and found the deer about 80 yards from where he said it was hit, we found the deer down,about two hours later after he came and got help,with a single hip wound, personally I think dropping a deer that quick with a crappy hit showed the 357 mag was a decent choice PROVIDED it was used properly. thats the second time Ive had the clerks who don,t seem, to have much experience, push the more expensive guns as options, vs the the best values , or reasonable choices get pissed off at my advice. after watching several friends use a 41 mag I see the results are a bit more similar to the 44 mag than the 357 mag , but with only a few deer and hogs being shot, with the 41 mag compared to the 44 and 357 , Id be reluctant to suggest its any less effective than the 44 if properly loaded and used. the bullets don,t seem to expand a great deal but they do penetrate deeply. 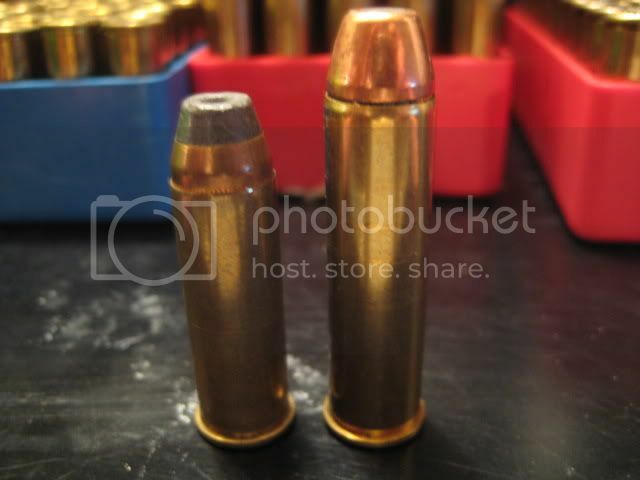 Ive had freinds use a 260 grain hard cast bullet from a 8.3/8" 44 mag revolver. 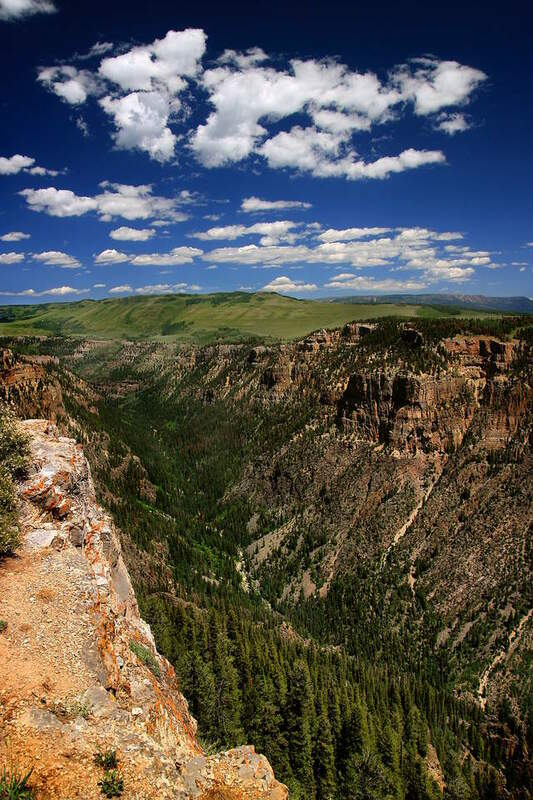 the Colorado hunting regulations, under legal hunting methods it states that a handgun load must produce a minimum energy of 550 ft-lbs at 50 yards to be legal for hunting. 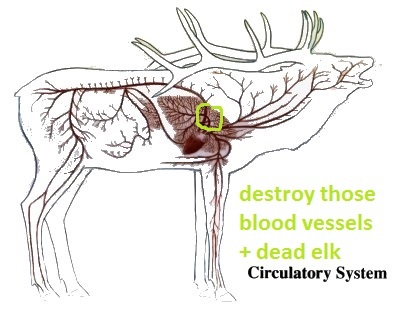 think about this the archery guys would have a difficult time hitting an elk with a 100 ft lbs of energy an arrow kills by blood loss, a good revolver load can easily deliver 700-1200 ft lbs of energy and drive a bullet thru the vitals and in many cases exit even an elk. hand gun hunting has far more similarities to archery than rifle hunting. IT requires getting into just about the same , but a bit longer 30-70 yards ranges in most cases that archery hunting is limited too. theres no real advantage that I can see in calibers like the 454 cassul and 460 S&W over a 44 mag, 480 ruger or 445 mag, or even the 50 S&W once you reach the power level that allows any of those revolvers to drive a bullet thru the vitals from reasonable angles . I,m always amazed at the guys who think nothing of shooting an ELK with a 270 win,30/06 at 500 yards and brag about dropping game at extended range who then tell you a 44 mag is far to light to use at 50-75 yards because it lacks the punch required, well if you do some testing youll find that a 44 mag does at least as much and usually more damage to deer and elks vitals with similar hits at under 100 yards when loaded with proper bullets than a 270win or 30/06 does at extended ranges. as long as the revolver and bullet design used have the required penetration potential to easily reach and destroy the vitals at reasonable ranges from almost any angle even if major bone and muscle protect the intended target,and the shooter has the knowledge of the games anatomy and skill with his selected revolver to accurately place his shot, adding additional power only adds recoil and slows recovery time that can allow or slow additional rapid shots that may or may not have much effect, punch thru the spine or brain, bust a shoulder or neck vertebra and you tend to get an instant responce, punch the lungs or heart or liver and youve delivered a mortal wound but it generally won,t be instantly fatal. plenty of guys have proven that a hard cast 300 grain or larger bullet from a 44 mag or 454 cassul or 460 S&W ETC. will do that on big game , its the shot placement not the power that matters, if your just banging off shots in the general vicinity , you better be very lucky. 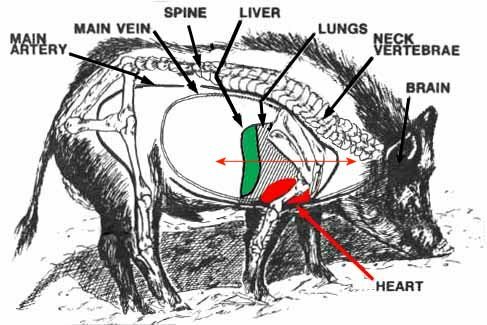 Ive had guys walk up as I was dressing out large hogs that commented that they could not believe I could kill a hog that large with a 357 mag, its all about bullet construction, your knowledge of anatomy and your skill placing the shot! what I don,t see as easily is if the 44 cal dan wesson super mag already shoots clear thru the game and exits leaving a rather significant amount of damage how hitting an elk or other non dangerous game is going to be a big improvement, the reason I make that statement is that Ive used a 600 grain 62 caliber maxi ball from my 62 hawken pushed to 1300fps, and a federal 10ga 2oz slug (thats 75 cal and nearly 880 grains)from my Ithaca road blocker at about 1300fps on deer and hogs and its not noticeably more effective on deer and hogs than the big dwsm revolvers been, any of them with good hits in the vitals tends to either drop the game or have the game run a short distance then drop after being hit? both the federal shotgun slugs and the soft lead mini balls expand to well over an inch across, absolutely devastating, you would find the damage caused amazing yet the results are still similar, ...bang!--..good hit.....dead animal in a very short time with any of the three firearms...provided shot placements decent. what Im trying to point out is that at some point theres a diminished return on additional power, double or triple the energy or bullet mass doesn,t result in any more lethal wounds, and with the revolver the bullets always seem to exit, so theres not much point in adding velocity or bullet mass. several of the guys I normally hunt deer and elk with have decided they want to use back-up handguns to hunt elk, with occasionally, mostly because, as has been pointed out time after time, most of the time we spend is spent glassing and sneaking thru rather steep heavily timbered areas and ranges tend to be rather short, most of the time. many of the guys know Ive hunted deer and hogs for 35 plus years with a large revolver so I got drafted into giving them some info, and lessons. 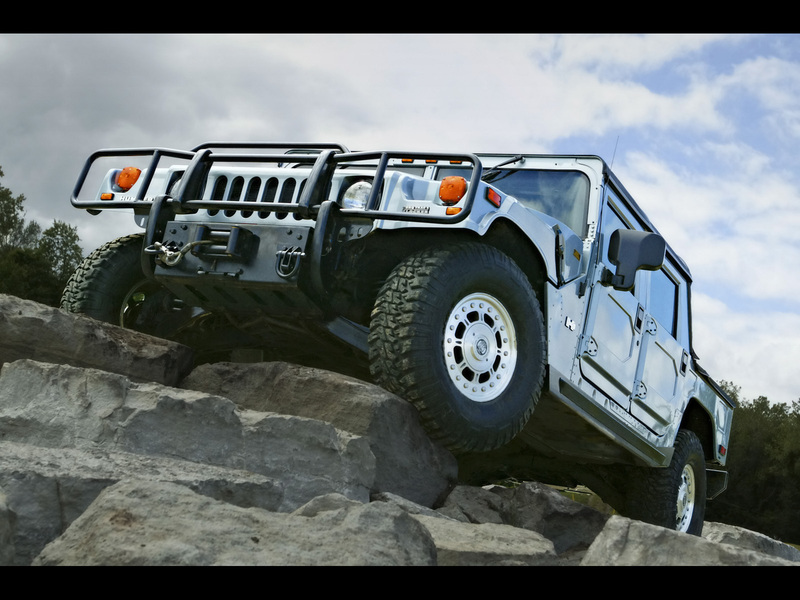 I said lets look over what your attempting to do and see if your willing to deal with the restrictions and limitations. don,t assume I'M telling you you've got a nearly hopeless task because Ive regularly, and consistently killed game with a heavy caliber revolver,and youll have 3-5 times the range advantage to work with over the archery hunters so its not all that great of a handicap, (using a iron site revolver) in skilled hands,but I'm forced to point out the limitations and the need for extensive practice before you can hope to be successful. 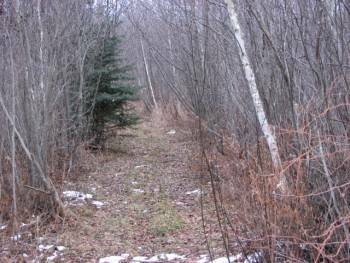 Id also point out that killing deer , hogs, or bear from a tree stand where you've got the time to carefully plan a shot and can reasonably expect the range to be well under 70 yards is a bit different that stalking mule deer or elk in aspen thickets where ranges may be expected to be in the 50-120 yard range and you'll have less than ideal conditions in many cases. I pointed out that the first requirement is knowing the laws and in Colorado, a hot loaded 357 mag with at least a 4" barrel is about the minimum caliber that's legal , but Id strongly suggest a 41 mag or 44 mag with a 6" or longer barrel as the reasonable minimum, all my revolvers have 8"-10" barrels, as the increased distance on the sights helps at longer ranges with old eyes trying to focus, and you must practice till you can place shots accurately in about a 4"-6" group from field positions , the max range you can consistently do that at should be the max range you consider shooting large game and if that's not at least 50 yards or more Id suggest sticking to a rifle as your main armament simply because the seasons only about 8-12 days long you'll be competing with rifle hunters during rifle season and you'll easily spend $800-$2000 for a few days hunting time so your without a doubt handicapping your self with a handgun rather than a rifle, it is rather foolish, tio do so unless you get far more proficient than most guys Ive seen are with hand guns , picture a large bull elk walking briskly past you at 200 yards and you have only a 41 mag -44 mag or even a 445 dws-mag with a 6"-10" barrel in your hand, how are you going to feel knowing that if you had a carbine rather than a handgun you could have a far better chance off success? and don,t assume if you fire at an elk or mule deer with a revolver that if the game runs that you missed, a revolver loaded with the proper hard cast bullets kills much like an arrow in archery hunting in that it punches a hole thru vital organs and it COMMON for game to take a minute or two to bleed out and drop and during that breif time much of the time the games trying to puts as much distance as it can between you and them. Ive carried a 445 dan wesson super mag revolver in a shoulder holster on many elk hunts but I also carry a 340 wby, or 35 whelen, or some other rifle or carbine, not just the handgun. handguns are great but they are not the ideal hunting tool in most conditions. they are excellent for use as security from bears, or other threats when back-packing out heavy loads of elk meat , when a rifle is a P.I.T.A. to carry , but they are not the ideal primary hunting tool, unless you are fully willing to deal with the challenge that the average user with a handgun,has with its limited range and accuracy compared to a rifle. and Id suggest its use only if the HUNT is more important to you than bring home MEAT! with practice it should be fairly easy for most guys to acquire the skill to hit game accurately with a handgun out to 80-120 yards , and with a quality revolver in a caliber like 41 mag-500 S&W theres no reason you can,t kill an elk with a single well placed shot at those ranges. .theres always a compromise in power, range,trajectory, recoil, revolver size and weight, the 44 mag is the minimum ID suggest,for most guys in a primary hunting revolver, the 480 ruger, 454 cassul, 445 dwsm, 475 mag and 460 S&W -500 S&W are all decent choices,but remember PRACTICE takes time and ammos expensive so ID tend to factor that into the choice, the 44mag will cost less than 1/4 of what a 500 S&W will in ammo if you reload, obviously the 500 mag hits harder but either caliber in skilled hands has the potential to easily kill elk. "The law in Colorado only allows handguns to be used during rifle seasons and with the following restrictions: Barrel length of 4â€ or longer, .24 caliber or larger with an expanding bullet, no shoulder stocks or attachments, must produce 550 ft/lbs. or more at 50 yards,"
because the area I hunt has more large hogs than deer most days, I tend to hunt with hard cast 300 grain lead bullets over 20 gains of H110 with my 44 mag revolver. when I hunt deer or elk with a carbine or rifle I occasionally carried a 357 mag revolver as a back-up in a shoulder holster,when I hunted with a revolver as the primary weapon I generally chose a long barrel 44 mag. my brother in laws hunted with a 357 mag marlin carbine and 686 smith and wesson for decades and while we are both been successful, theres zero question in either of our minds that the 44 mag, properly loaded is the better tool for hunting,if you can handle the recoil in a revolver, (my brother in law never has been comfortable doing that so hes stayed with the 357 mag.) but thats not the same thing as saying the 357 mag won,t kill deer hogs or even elk effectively in a skilled hunters hands,or is not easier and cheaper to shoot. this is a great revolver, with the correct loads its both extremely accurate and easily cared for, plus its able to use either 44 mag ammo or hand loads that are close to 454 cassul power in a 10" barrel, with the 300 grain hard cast, bullets its incredibly effective on deer and hogs in my experience at the 120 yard or closed distances that iron sights more or less limit precise shot placement too! IVE DONE A GREAT DEAL OF TESTING WITH HARD CAST 44 BULLETS,you might want to keep in mind that the 44 mag case capacity and current powders require about a 6" or LONGER barrel to get any bullet of 280-300 grains to max velocity , mostly because max cartridge length dictates the seat depth to some extent and at some point your forced to start seating bullets much deeper as bullet weight is increased and once you get into the 300 plus grain weight bullets,in most revolvers its almost mandatory to use the longer barrels to allow the full burn on the slower powders required to shove those heavier bullets to max velocity, but slower powders generally require larger powder capacity. youll have a hard time pushing the heavier bullets in a 44 mag to velocities that allow it to out penetrate the lighter weight bullet because the heavier bullet takes up too much case capacity,in the smaller 44 mag case, yet either is easily able to kill elk or large game in skilled hands as both penetrate deeply with the correct loads and shot placement is more critical than velocity, in my experience the 44 mag is at its most effective level when used with the 270 grain-to-310 grain hard cast projectile weights. the only time I had a bear in really close, I had a 445 DWSM pistol in my hand,loaded with 300 grain hard cast at 1400fps, aimed at his skull as we sized each other up from about 30 feet, I had failed to notice him until he stood up next to my dead elk ,I was returning to the ELK ID killed earlier to pack out more meat, I said something loud and hopefully menacing, and the bear decided I was either nuts or no good to eat or a genuine threat, as he spun and walked off briskly. "have you ever felt under armed with a hunting handgun? or have you ever needed to pass on a shot because you knew it was out of your realistic range limitation and ability to place a shot accurately?" I was loading some ammo for my 445 dan wesson super mag revolver and had a friend over thats never hunted with a handgun as his only weapon, hes used his rifles for all big game hunts and he asked me that question. now Ive used a 44mag or 445 dwsm handgun for decades,and while Ive certainly seen game at ranges exceeding my self imposed ,hand gun accuracy comfort zone of about 120 yards Ive never thought it was much of a handicap, I just figured out how to get closer until I was comfortable making the shot. If the archery guys can collect as much game as they do with about a 40-50 yard effective range limitation certainly having twice that effective range is hardly the limitation that will ruin your hunts chances of collecting game! and after dressing out game hit with a 44 mag or 445 dwsm I don,t see them as any limit on game as to limited lethality. 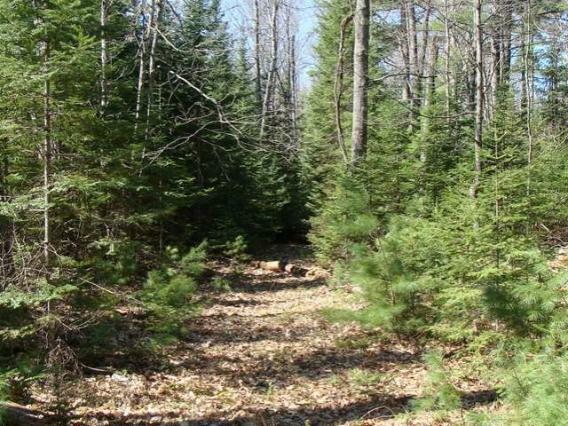 I rarely hunt where that lack of range is much of an issue as hunt pressure tends to be rather low in the areas I hunt as I get into areas far from easy road access and in thicker tree growth, areas or steep canyons where ranges tend to be well under 100 yards far more often than over. it just doesn,t make sense to me to hunt where your not using the strong points of your weapon, and with a handgun thats ease of transport, ability to keep your hands free most of the time and travel into areas most guys avoid like the IRS or an EX-wife... but thats to your advantage because GAME tends to avoid the easy access areas and concentrate in those far less hunted areas also. and yes before someone asks you WILL occasionally find even near perfect hits result in game running a few yards or even 50 yards,just like with archery, that does not mean hits are not mortal. I had several similar incidents with large hogs and light jacketed bullets where ID knock them down only to have them get back up or at least be flopping around due to less that full penetration, swapping to hard cast 270-310 grain bullets reduced the number of hogs an deer that dropped instantly, but eliminated the long trailing jobs resulting from less than mortal wounds, a hard cast might not kill as dramatically in every case, but its far more dependable at getting full penetration and destroying tissue all the way in, thru and out the other side. I went to the range yesterday with a friend (JACK) who just purchased a new 8" 500 S&W revolver , I brought along my 445 dan wesson super mag and we were going to sight in his revolver and I wanted to practice a bit with mine at the same time, now Ive had my 445 dwsm for about 20 years and I load 300 grain hard cast gas check bullets to about 1470fps so while its not in the same power range as the 500 S&W pushing 350 grain at about 1700fps I know from experience that my 445 dwsm shoots clear thru all the hogs and deer Ive ever shot, so more power seems rather unnecessary, and the difference in recoil is noticeable. well off the bench rest I can keep a 3" hundred yard group with THAT load but I found that a slightly different load was a bit more accurate. Id also loaded a few 335 grain NEI bullets at 1400fps and they produced a 2"-2.3" group size off the bench rest which is amazingly good for these old eyes and iron sights. now I try to limit shots in the field to the 75-120 yards ranges where I'm confident of good center chest hits on game, so It looks like Im going to be loading more NEI bullets for future hunts. Jack , is an excellent pistol shot and he had zero trouble with the 500 once he got it on paper and sights adjusted , his groups were about 3" at 50 yards and he ran out of ammo before he could try it at 100 yards so he played with my 445 DWSM for a few shots and after that he said something I thought was interesting, he said if the DWSM 445 was still in production he probably would have bought one and after shooting his 500 S&W he thinks that he probably should have purchased the 460 S&W because while the 500 is a great idea in theory the recoil makes it a bit much for extended practice and while hes glad he purchased the revolver if he had it to do over he would have purchased a 10" barrel 460 S&W. Id point out that the main potential advantage to use of a hunting revolver is a slight increase in hunter mobility, allowing you to get into places that might be a bit harder carrying a rifle and the ability to more easily pack out game once your successful but you tend to pay a price in that you really DON,T want to shoot an elk 5 miles down into some deep canyon that requires you to use both hands free to climb out of (ASK ME I KNOW ONLY TOO WELL FROM EXPERIENCE) yes hunting elk with a handgun can be done, and if you carefully pick the area "its a real HOOT!" but you also feel like a darn fool when your only firearm is a revolver and you see the first 6 x7 elk you have ever seen on public land walk by at 300 yards and you know if you had carried a light rifle he would be yours, but with a revolver your limited to much shorter ranges making an ethical kill. IVE carried and used a handgun on dozens of hunts but its a secondary to a decent rifle, the handgun gets used in the thick stuff or when packing out game but I drive 2300 miles one way to hunt elk and generally have only 7-9 days a year to actually be in the field,I back pack into areas and camp cold in remote areas, Im successful frequently and costs average easily $2000 plus on a hunt, so Im not going to be watching the trophy walk by if I can avoid it . I found this after a quick search. 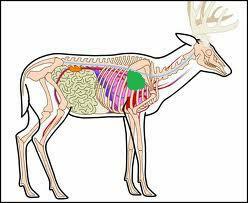 keep in mind a deer or elks vital organs are seldom more than 10" under the hide, so a revolver that penetrates even that far can deliver a mortal wound, that being said in 40 plus years of hunting with hard cast bullets and a 44 mag I can only remember one or two bullets that didn,t penetrate all the way thru deer and exit. I hunt rather regularly with a 10" barrel 44 mag revolver and have found little problem with making shots out to about 125-150 yards with iron sights,from a steady sitting position, into a 2 lb coffee can size target, but I rarely shoot game at ranges past 80 yards, and I rarely need too as handgun hunts are generally a thick cover close range affair, at under 100 yards a hard cast 300 grain bullet regularly shoots thru a deers chest and at times thru hogs. 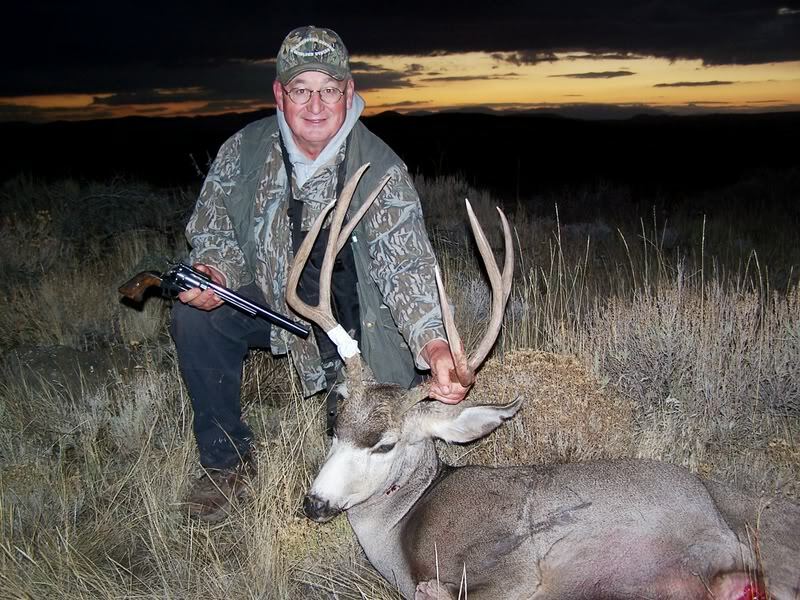 "As a shooter of big bore sixguns for well over four decades, and also one who knows how effective sixguns can be on big game, I must say I was surprised at how effective various sixgun cartridges proved to be during the penetration tests. For the shooting and experimentation, the standard bundles of newspaper soaked in livestock watering tanks were used. No guess. No golly. No opinion. Going back to the five cartridges mentioned at the beginning the results were most interesting. Randy Garrett's .45-70 Hammerhead 530 gr. hardcast at 1,550 fps went 55" into wet newspaper. A 495 gr. hardcast .500 Linebaugh fired from a 5.5" sixgun with a muzzle velocity of 1,270 fps was right behind it at 52". The .500 Nitro Express with a solid weighing 570 grs. came in third at 48", followed by the .458 Win. Mag. with a 500 gr. solid traveling at a muzzle velocity of 2,260 fps and 47" of penetration. Finally, the .45 Colt with a 350 gr. hardcast bullet at 1,400 fps gave 43" of penetration, or only 5" less than the .500 Nitro and 4" less than the .458. Of course, the .45 Colt load tested is only for use in the Freedom Arms .454 or custom five-shot .45 Colt revolvers. 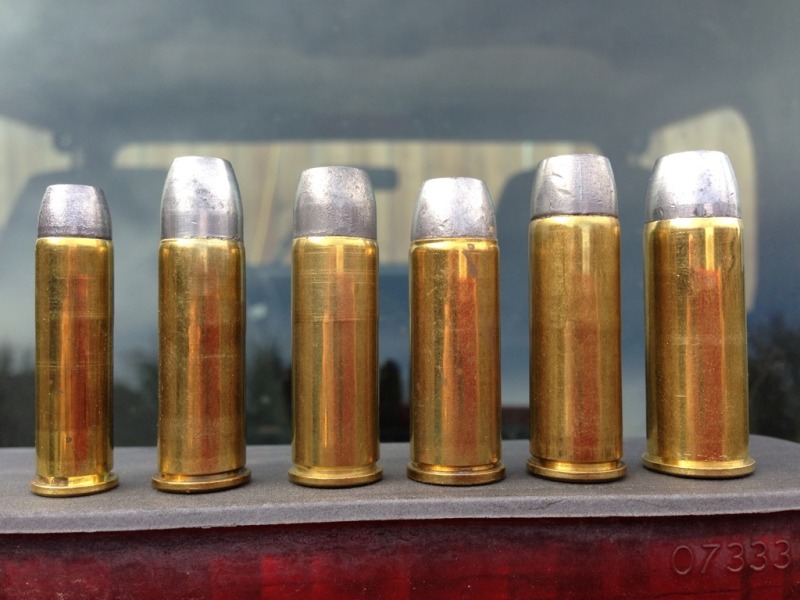 The .44 Magnum was not really given a thorough testing as the only load on hand was a 250 gr. Keith bullet at 1,200 fps which went 27" into the wet newsprint. 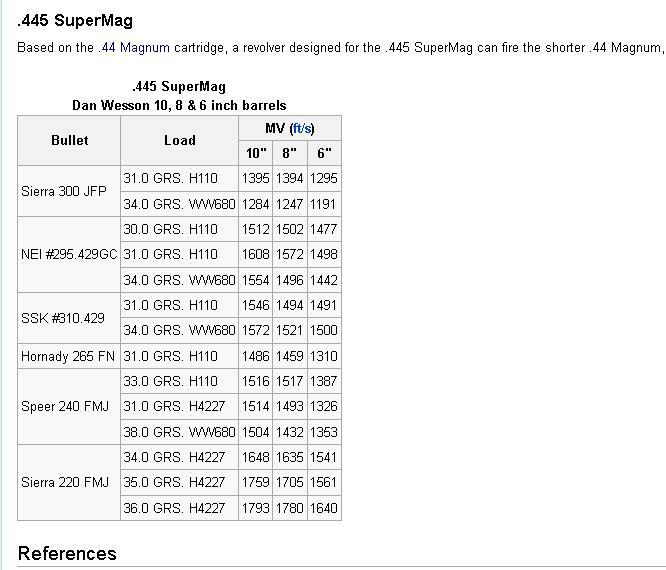 At next year's seminar, hopefully we will have a larger variation of .44 Magnum loads to test, especially with 300 gr. bullets at muzzle velocities from 1,200 to 1,400 fps. We also had only one load for the new .480 Ruger, Hornady's factory offering of a 325 gr. XTP at 1,350 fps. This round is not designed for deepest penetration but did expand well and travel 17" into the newsprint. How did the truly big bore sixguns compare, the Big Berthas, the .45 Colt, .454 Casull, .475 and .500 Linebaughs? For the .45 Colt, in addition to the already mentioned load, a 310 gr. Keith at 1,250 fps -- one of my favorite loads and safe for use in Ruger's Blackhawk or Bisley -- penetrated 36", while the 300 gr. LBT traveling at 1,180 fps penetrated 2" deeper. Using Cor-Bon's 360 gr. bonded core at 1,500 fps in the .454 yielded 45" of penetration. Moving up to the .475 Linebaugh, a 420 gr. LBT at 1,335 fps did 47" while the same bullet at an easy-shooting 1,050 fps still penetrated to 40". We have already mentioned the second-place finishing .500 Linebaugh load. Others from this category of the biggest of the big bores included a 480 gr. Keith-style bullet at 1,200 fps and 41"; a 435 gr. LBT at 1,270 fps, 38"; and a 435 gr. LBT at only 1,000 fps still went 34" into the test medium. This tells me that for most of us, and the game we pursue, either a .475 or .500 Linebaugh traveling at a relatively sedate 1,000 fps will do anything and everything we could ever hope for. Actually, we can draw the further conclusion that the .44 Magnum with a 250 gr. bullet at 1,200 fps or a 300 gr. .45 Colt at 1,250 fps will certainly handle any deer that walks -- but then we already knew that! Now we know with actual experimentation why it is big bore sixguns perform so well on large or dangerous animals including Cape buffalo, elephant, lion and the big bears of Alaska. The big bore sixguns in this case, from top left clockwise Ruger .44 Magnum Freedom Arms .454 and Ruger Custom .45 Colt. Ruger Custom .500 Linebaugh and Freedom Arms .475 Linebaugh can actually out penetrate most rifles. "Who says the .500 Linebaugh doesn't kick?" .45-70 530 gr. hardcast lead 1,550 fps 55"
.500 Linebaugh 495 gr. hardcast lead 1,270 fps 52"
.500 Nitro Express 570 gr. FMJ solid 2,000 fps 48"
.458 Win. Mag. 500 gr. FMJ solid 2,260 fps 47"
.475 Linebaugh 420 gr. LBT SWC lead 1,335 fps 47"
.454 Casull 360 gr. honded core 1,500 fps 45"
.45 Colt 350 gr. hardcast lead 1,400 fps 43"
.500 Linebaugh 480 gr. Keith 1,200 fps 41"
.475 Linebaugh 420 gr. LBT SWC lead 1,050 fps 40"
.500 Linebaugh 435 gr. LBT SWC lead 1,270 fps 38"
.45 Colt 300 gr. LBT SWC lead 1,180 fps 38"
.45 Colt 310 gr. Keith SWC lead 1,250 fps 36"
.500 Linebaugh 435 gr. LBT SWC lead 1,000 fps 34"
.44 Magnum 250 gr. Keith SWC lead 1,200 fps 27""
each weapon system has its strong points and weaknesses,you know when selecting that weapon what your limitations will be, thats hardly means that in skilled hands and under the conditions a trained operator will use those weapons to maximize the advantages each weapon system has, that it won,t be just as effective as any other within its designed operational area. I wonder how many of those guys who think the properly loaded 44 mag is a EFFEMINATE have ever seriously hunted with one? yes Im well aware theres zero question that a revolver in some of the hotter 45,475 or 500 caliber cartridges produce more power, but once your punching completely thru game theres more to be gained in my opinion,with precise shot placement and the option of a rapid precisely placed follow up shot than in just pure power. 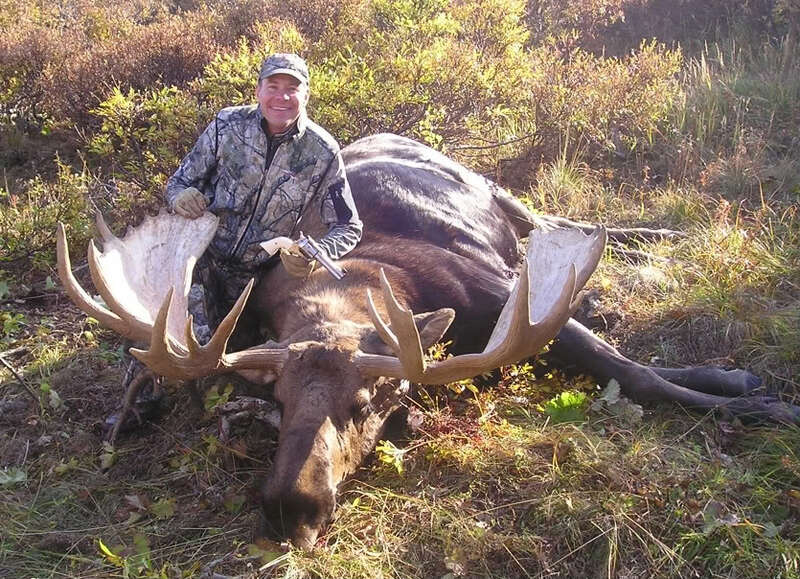 Ive hunted for decades with a 44 mag and 445 dan wesson super mag , Ive seen several elk killed very dead with a 44 mag revolver. yeah I can hear the screaming... and while I have zero doubt that the larger calibers hit harder Its been my experience that its precise shot placement thats the key. while its hardly a really good idea even cape buffalo ,grizzly and polar bear,and elephant have been killed with a 44 mag revolver. does anyone think a 44 mag with the proper loads can,t punch thru the skull or reach the heart of most north American game at any semi reasonable range you might use a revolver at? 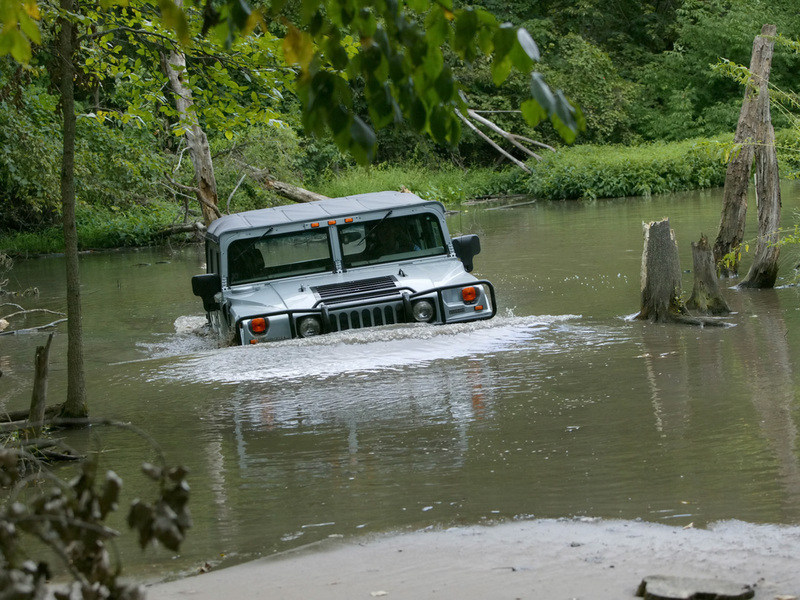 it may not be the most powerful , newest,or glamorous choice but in skilled hands with the proper loads it gets the job done! with ANY handgun, correct shot placement and knowledge of the games anatomy is critical to a fast kill. yes a fast expanding bullet will kill faster and impart more shock if placed into the heart/lung area, but its NOT ALWAYS 100% dependable for and INSTANT DEAD RIGHT ON THE SPOT, of BULLET IMPACT POINT KILL! a balance needs to be achieved, and in my experience a hard cast bullet has advantages as it usually exits after full penetration, and leaves a good blood trail. 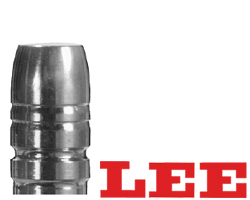 theres two very effective routes you can take, personally I prefer the lee 310 grain hard cast over 21 grains of h110 powder sized .431, or .001 over forcing cone diam. cast from 95% ww alloy and 5% tin, as its accurate and penetrates well and almost always exits. now I had more deer run with the hard cast, but on average the distances were rather consistent and usually well under 40 yards, while the hollow points generally drop deer fast or occasionally your in for a a short tracking job with little or no blood trail. If I was going to poke something that might bite back Id select the 310 grain lee every time! 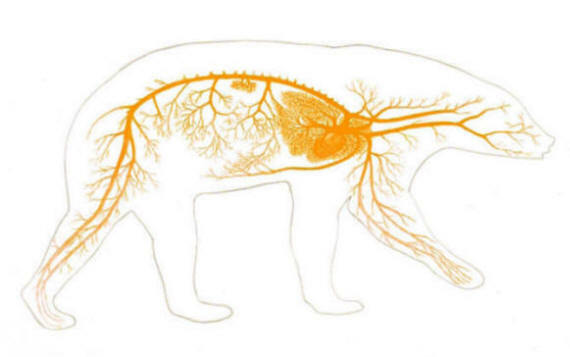 "all of the energy that is carried by that bullet is expended in the animal, instead of exiting the animal and taking energy with it." 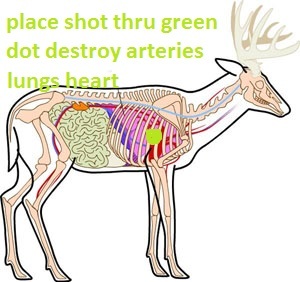 is nearly as useful as having a larger exit or at least TWO open holes in the hide to allow blood to drain, and that the "SECRET" here is knowing the games anatomy and proper shot placement, and the near instant destruction of vital organs rather than any slight increase in total energy transfer. the fact is that handgun bullets kill by disrupting or destroying tissue, and organ function and blood loss, more similar to archery than what a 270 win or 300 mag does with adding hydrostatic shock and a much larger temporary cavity. the .44 seems to be about the ideal combination of enough power for anything I'm going to shoot, and manageable recoil. Starting loads for the Casull, with the 335 gr. hard cast, are identical to the max loads in the .44 mag with 325 gr hard cast. This is a load I have complete confidence in for elk. btw Ive done a fair amount of testing bullets shooting them into various back stop mediums. Id point out that its been my experience that a 44 mag has has limitations with bullets heavier than the 300-310 grain range simply because the cylinder length limits loaded cartridges over all length, and barrel twist rates in some guns that limit how heavy you can go on bullets. 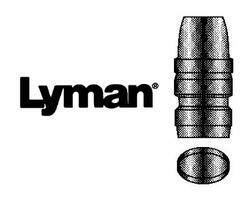 the 300 grain lee and lyman bullets are about the max length that you can load before the bullet volume crimped below the case mouth begins to restrict useable powder space with the slower pistol powders. 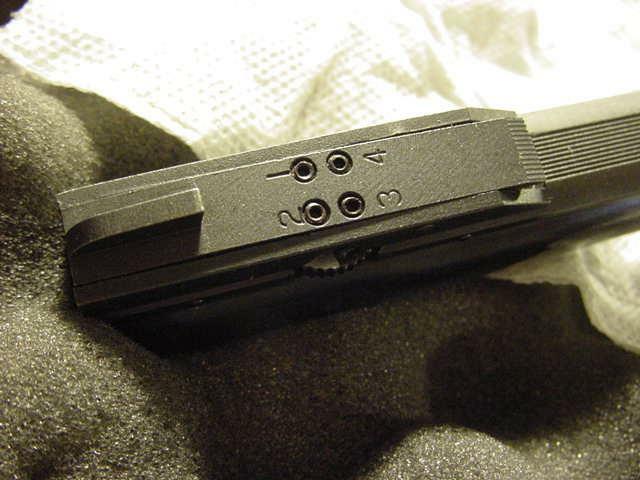 ive purchased and tested both these NEI designs and while they have proven to be effective in the longer case 445 dan wesson super mag, they can,t be loaded to enough velocity to markedly out perform the slightly lighter designs in penetration or accuracy ,I linked to above in a 44 mag in my experience. 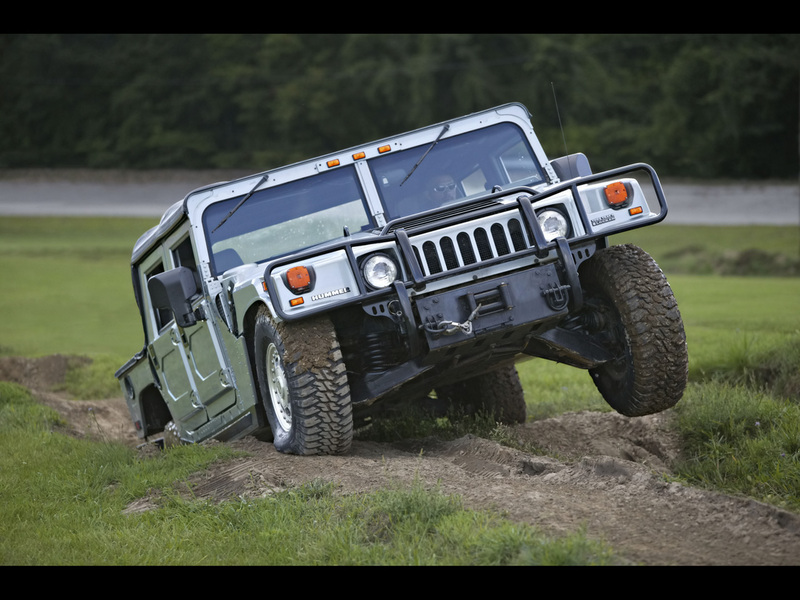 they do work rather well in the larger 445 dwsm, but not to the extent I feel they pose any huge advantage. If you've heard hand guns just don,t put deer down and a 357 mag is just not up to the task, I can tell you from DECADES OF experience that yes theres a difference, and the 44 MAG PROPERLY is a bit more effective, but the 357 MAG LOADED WITH A GOOD 158 GRAIN SOFT POINT OR THE BULLET I'VE USED FROM NEI (link below)FOR decades is 100% lethal in the hands of a decent shot and you can get complete pass thru shots with decent hard cast bullets in most hand gun calibers suitable for hunting, yes you make a good point that the 357 mag doesn,t always seem to put a deer down with near the authority that as an example a 44 mag does but its been my experience that results are a good deal more about exact shot placement, than any change in caliber, within certain limits. 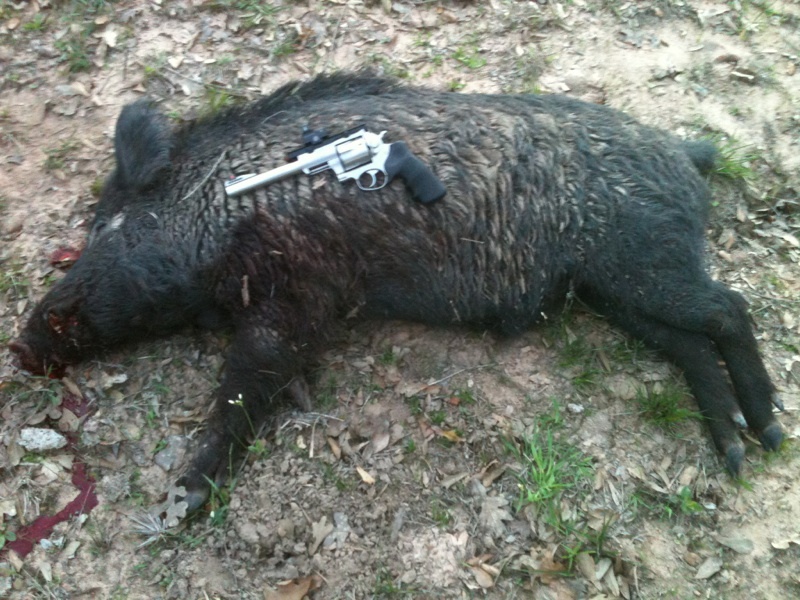 When I first started hand gun hunting, I had most deer I shot with a 357 mag run a bit then drop, while the deer I,d shot with a 44 mag rarely went nearly as far, but Ive also had both deer and hogs drop on the spot with both hand guns. and as I became a better and more selective about shot placement, both hand guns seem to work more effectively, try placing your shots thru the green area, think of it as a soft ball sized area between the front legs, if your shot hits there your results will be better, yes some still run, a short distance but its been years since one ran very far. back in the early 70s I purchased a S&W mod 27 with a 8 3/8" barrel and loaded it with factory loads to go deer hunting. 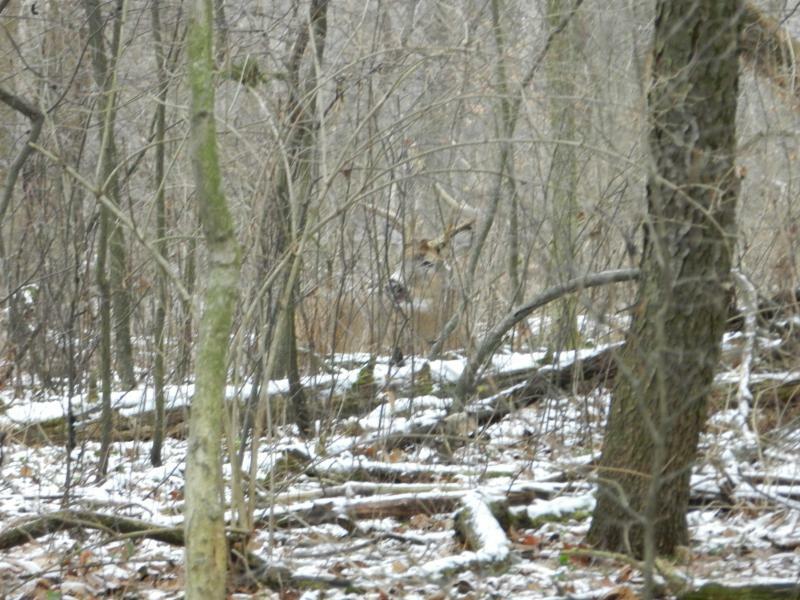 I was not the worlds best shot, and knowing that I only hunted the areas where I knew the brush to be too thick for there to be much of a chance of even seeing deer past about 50 yards. 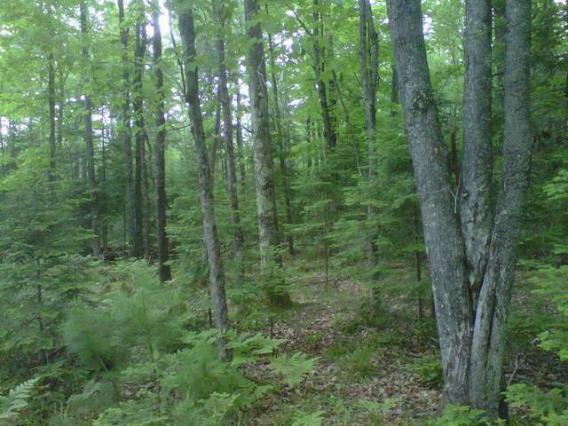 Now I found an area where HOGS were fairly easy to find but deer were a bit less common but still available. I had initially loaded that revolver with 158 grain hollow point factory ammo, and over the first several years I found that the most frequent result, was that once I made a shot, Id spend the next 30 minutes getting down from a tree stand and slowly following a blood trail, but I always found the deer or hog within about 50-80 yards, from the place they were hit! I didn,t blame this lack or perceived lack of effectiveness on the revolvers power as the bullets, Id used,because they usually zipped thru, the game and obviously produced a fatal wound. I got into hand-loading because I knew I needed a great deal more practice and hand loads could be made for 1/4 the cost of factory ammo. this resulted in me shooting a great deal more and with that practice I gained a good deal of experience and accuracy improved dramatically, I blamed my lack of accuracy,with the factory loads in the first couple years on lack of practice , as the retrieved game was seldom hit exactly where I had aimed. now my brother-in-law owned a 45 acp govt model and he frequently hunted with me with very similar results, but he got very few exits and at times longer trailing jobs. and he has used that 357 mag carbine for at least 3 decades with zero complaints. I figured I might not be hitting exactly where I wanted too but with more practice that would be cured, so I started practicing a great deal more , which eventually got me into bullet casting and reloading, but I also realized that a revolver with a bit more punch would also help, so I purchased a 8 3/8" barrel S&W 44 mag. the result might be predictable,to most of you guys, in that it took me about two more years to get really effective and accurate with the revolver , while my brother-in-law who purchased a marlin in 357 mag lever action, was instantly much more effective, as his accuracy went from 8"-10" 50 yard groups with the 45acp pistol, to 2" 50 yard groups shot with a 4x scope on his marlin carbine. he had decided that a hand gun cartridge had plenty of power but its use in a revolver lacked accuracy and control, I decided to stick with the hand gun , and force myself to master the skill required,,but master its use took a great deal of practice and I also decided too hedge my bet by adding a bit more power. now 35-40 plus years later I look back and its obvious we both made the correct decisions, as he still hunts with that 357 marlin carbine and I still have a 44 mag revolver, but I upgraded to a 10 5/8" barrel version with better sights. and swapped to a 310 grain bullet, in the 44 mag and started to get consistently better results with a good many DRT kills. I wondered if it was the power or my skill so after a few decades I started using the 357 mag revolver on hog hunts occasionally, and quickly realized that the 357 was very effective compared to what I used to be able to do with it,in that I now get a good many quick kills, and shooting its very easy, but its not a 44 mag, and its obvious its not hitting as hard. http://www.hornady.com/ballistics-resou ... calculator, you can use to get a good idea on bullet trajectory, but keep in mind the ballistic program energy predicted doesn,t always give you a great idea as to the larger and heavier revolver bullets effectiveness, a 44 mag may not pack impressive energy but the bullet mass and proper placement has many times produced results greater than you might expect. as an example a 30/30 carbine and a 44 mag revolver can have similar ENERGY , but in my experience they start out about equally effective at closer ranges, yet out at 120-180 yards Ive seen consistently the heaver 300- 320 grain, 44 slugs seem to hit game harder even if the energy predicted is lower, now I,m not saying a 44 mag should be used out past about 120 yards in most guys hands but it sure won,t bounce off game like some guys might have you believe! obviously hand gun hunting with an iron site revolvers limited by the precision most guys can accurately place a shot to a games vital organs to under 100 yards in most cases, but be aware its not limited to that distance by a lack of ability to deliver a fatal blow. Idaho wrote: Handgun hunting is much like archery hunting, while one person might be very good at 30-40 yds another person might be very deadly at twice that distance, its really up to the shooter/hunter to determine his or her distance. Out here in the west shots can be a little on the long side so practice out to 100 yds or so & do it from all different positions. The classic off hand shot should be avoided if possible but its great practice in case its necessary. A cast bullet is very effective & will penetrate way beyond what most jacketed slugs will do. Plus the nose on a cast slug is usually much wider than the same weight jacketed slug. 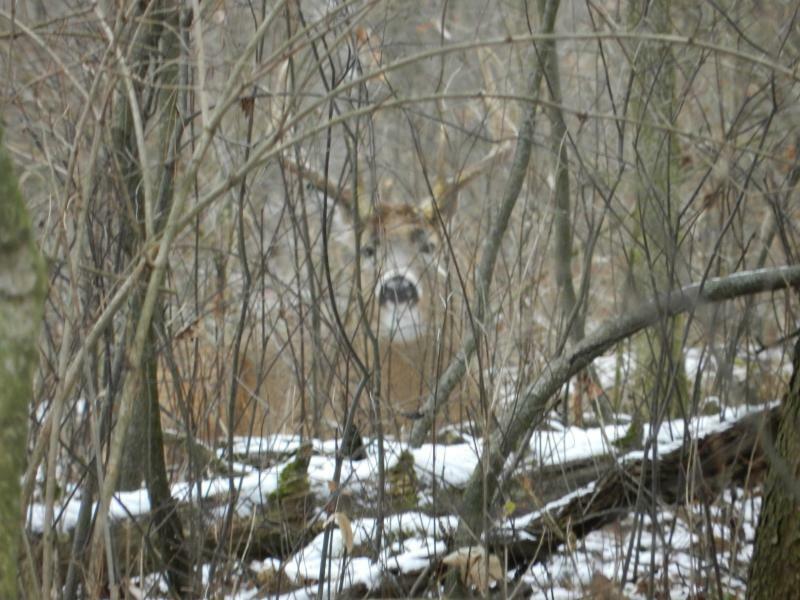 You need both accuracy & penetration when hunting big game, if you come up short on either one you are in trouble. After using cast slugs for almost 50 years, on everything from mice to bull moose, including African game there's no finer hunting bullet out there. 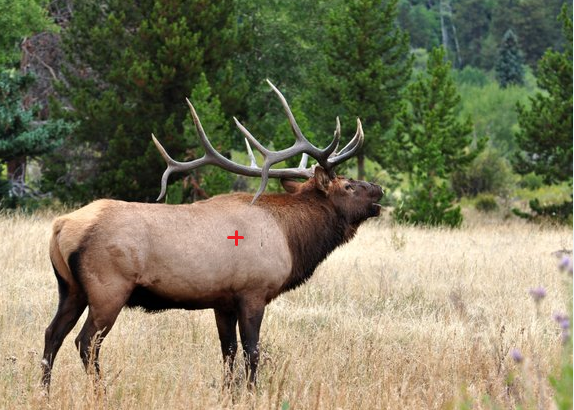 I have taken elk with the Speer Gold Dot 270 gr. 44 slug & it worked great. Another great bullet that isn't a cast slug is the Belt Mountain Punch solid. 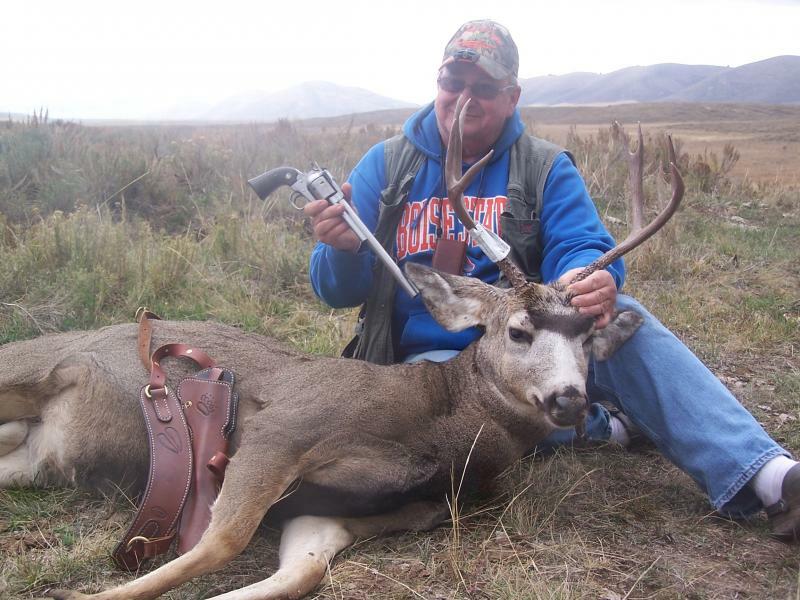 This is a 4X4 muley buck that I shot 10 days ago with my 10 1/2" 44 maggie, shot was 97 yds with a 240 gr. cast HP, complete penetration & down. Two of my son's ranged the shot after the kill. I got asked how far away a hand gun is an effective tool? over the last 45 plus years Ive introduced and taught more than a dozen guys how to effectively hunt with a revolver, some guys used 357 mags, 45lc, 41 mags etc. but the 44 mag has been the most common tool and its effective in skilled hands, the newer more powerful revolvers have a place but even the 44 mag is more than many guys can easily handle effectively. remember it takes a great deal of practice to become a good shot under field conditions, and learning to hand load is almost mandatory due too the costs that required practice will require. getting more than 1200fps out of a 8 3/8-10" barrel 44 mag handgun is very easy, and a 300 grain hard cast bullet at over 1100fps is all that's required to produce a mortal wound, if your using a hand gun in most cases I find I,m going to limit shots to ranges I feel 100% confident of my hitting my target exactly where I want too and under field conditions,and ranges. there's plenty of guys who are better shots than I am, but I consistently kill game! And At least for me that range where I feel confident making shots, rarely exceeds 70 yards, with 120 yards being a self imposed limit, because off a good rest that's about as far as I can be sure of hitting where I aim. that is the max range I will only approach under rare conditions, the revolver is still deadly but shot placement starts to be a bit iffy! most of the game I killed in my early years was at very close range simply because I was not sure I could make shots hit exactly where I aimed at first over 20-25 yards, as my skill improved I felt confident out to 40-50 yards and eventually further, I would say 50% of the game runs a short distance once hit but rarely have i needed to track further than 30-40 yards, and a frantic run, of 20-30 yards at most is common. Ive hunted deer, elk and hogs for close too ,5 decades,I long ago lost count of kills with my revolvers, don,t get too concerned with the ability of the weapon you choose to do the job, its mostly shot placement not velocity, energy or bullet weight that matters within reasonable limits,and your correctly loaded 44 mag revolver provides the required punch, THAT BEING SAID, the CALIBER, POWER LEVEL AND projectile should be matched to the intended target, YOU SHOULD KNOW YOUR GAME ANATOMY WELL!,and BE able to do the job OF CORRECTLY PLACING A SHOT THRU THE VITALS, and under less than ideal conditions, of range and FROM entrance angles THAT ARE NOT IDEAL,and you must know the games anatomy, and if you can,t consistently place shots accurately under field conditions, what you carry won,t matter much! EVEN, THIS LEVEL OF ACCURACY TAKES A GREAT DEAL OF PRACTICE, and if you can,t consistently hit a coke can size target ,you really should not be shooting game beyond that range, you should in my opinion limit shots to the range you can, do so! YEAH! there's ALWAYS going to be game that's well hit with any bullet design that won,t instantly fall on bullet impact so don,t expect that the result of a well placed hit will always DROP GAME INSTANTLY.